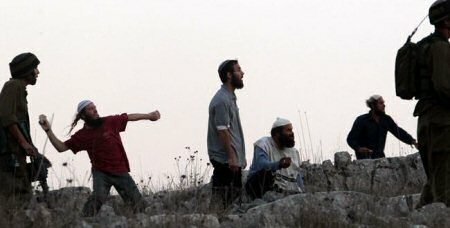 Israeli settlers, on Sunday morning, have seized 120 dunams of land from Jalud village, south of Nablus, as Israeli authorities are constructing the settlement of Amihai on Palestinian lands, as well. Ghassan Daghlas, who is responsible for the settlement files in the West Bank, said that settlers are taking advantage of the construction of the Amihai settlement to implement their ambitions in the land, and overtook 120 dunams of agricultural land in the village of Jalud. Daghlas added that, in light of the international silence of the construction in the new settlement “Amihai”, the settlers of the “Uday Aad” outpost, exploiting what is happening next to them in the construction of the new settlement and the seizure of more than 80 dunams of land in basin 16, the site of the plain Abu al-Rukh and Harika Jouda, adjacent to the settlement point, and plowed, and planted wheat and grapes, in collusion with the army. Daghlas said that the settlers of “Ahiyeh” outpost seized more than 40 dunams of land located in the area of ​​the injection site, razed and cultivated it with grapes and erected large agricultural houses there. He added that the lands seized by the settlers belonged to a number of citizens, including Hisham Ahmed Haj Muhammad, Mahmoud Fawzi Haj Mohammed and Ahmed Abdul Ghani Haj Mohammed.